IF You Need a Outdoor Washbasin? Just Try Sammid Folding Washbasin! Completely waterproof to avoid spillage and mess. - Great ideal for Camping, Picnic, Hiking and other outdoor activities; Can be used for collecting water, sand, small fish etc. If any questions,please feel free to contact us ,we are always here to be helpful! 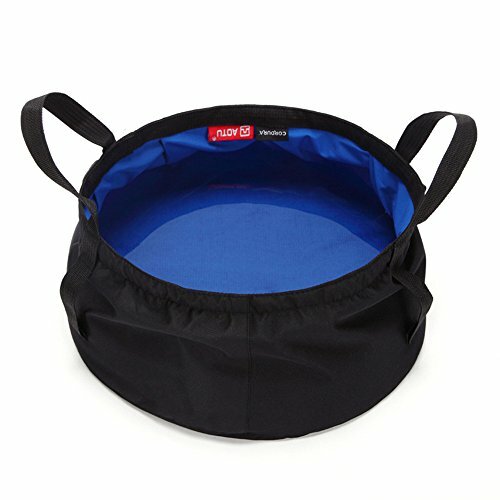 ★MULTIPURPOSE WATER BAG: Can be used as a wash basin,can carry water, ice or sand, wash dishes, keep your drinks chilled, doing laundry, potable water bucket or foot bath basin. Handy for your outdoor recreation like camping, hiking, fishing or picnic at the beach. Great for traveling . ★ FOLDABLE & COMPACT: Lightweight and very compact.This portable sink folds up easily for storage and takes up little space folded. Can be folded and wrapped with the mini bag (included) when not in use. and the collapsed washbasin can easily fit back into the pouch. ★EASY TO USE: 2 tote carrying belts to ensure efficiency of transporting potable water. You can easily carry the bucket with them. For your convenience, we design this portable bucket in a way that when you carry it and it's full of water, it bends around the handles in a way that holds liquid well without tumbling over or water spilling out. it's also easy to clean - just flip it inside out to wash and dry it upside-down! ★DURABLE: Made of high quality Nylon+waterproof fabric, can be tear-resistant and leak-proof. Filled with water and stand on flat ground that will not fall down. ★LCRAFTED FOR MAXIMUM VOLUME: Can hold up to 8.5L of water .Re-usable and washable.